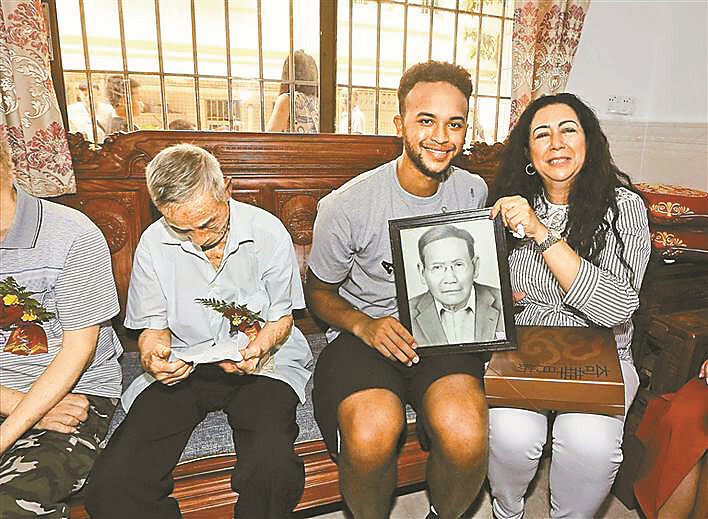 American NBA basketball player Kyle Anderson reunited with his Chinese family in Longgang District on Wednesday with his mother, whose grandfather was a native of a village in Longgang and emigrated to Jamaica around the 1920s. Amid the sound of firecrackers and cheers, Anderson arrived in Xinmu New Village in Pinghu with his mother, girlfriend and best friend. 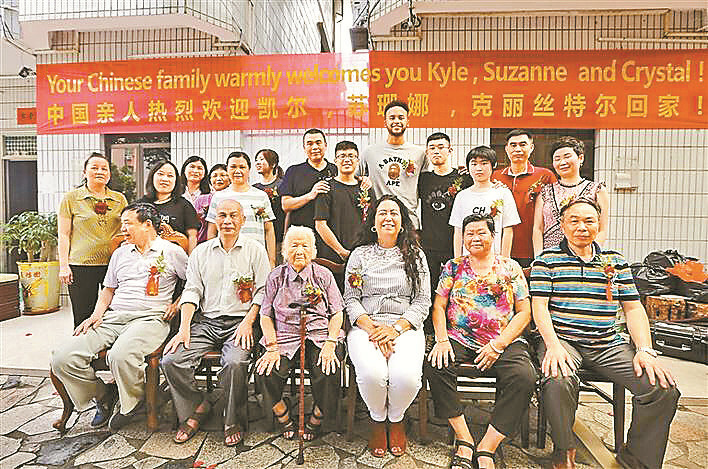 The Li family in the village welcomed their overseas family members, whom they had never met other than on television, with a banner hung at the entrance of the village that read, “Your Chinese family warmly welcomes you, Kyle, Suzanne and Crystal!” in both Chinese and English. The Li family in the village welcome their overseas family members with a banner hung at the entrance of the village. Anderson’s cousin Li Tianping, who is in his 70s, introduced more than 30 family members to the basketball player and his mother Suzanne. Li gave Anderson and Suzanne a family-tree booklet that included their names. In return, Anderson brought his Spur’s jersey for his cousin. During the family gathering, Anderson, 25, found himself overwhelmed by the warmth of the family. Everything in the village seemed exotic and interesting to him. According to Hakka custom, the first thing family members do once they travel back to their hometown is to worship their ancestors. Anderson joined the worship ritual by offering lit incense to their ancestors. He also dined with the family, learning how to use chopsticks and drink baijiu, Chinese liquor. A lot of villagers returned to see the famous American NBA player. Anderson also signed autographs for all his relatives and asked them to watch him play on the television. It is not news that Anderson has Chinese ancestry, but even his mother found out only recently that her grandfather had come from this village in Shenzhen. For the past four years, Suzanne had been looking for her Chinese family. She quit her job in Canada to focus on tracking down her family history. She joined activities held by local Hakka groups in Canada and also turned to professional institutions for help. A cousin of Suzanne’s identified as Donald, who does business in China, helped her find her grandfather’s brother, who went to Jamaica for the gold rush along with Suzanne’s grandfather, Li Chongxin. Anderson and Suzanne were told that Li Chongxin was born in 1877 and left the country when he was a middle-aged man. Leaving sons and daughters at home, Li Chongxin married again in Jamaica, and Suzanne’s mother was one of his children. However, the family was reluctant to talk more about Li Chongxin because he had abandoned his family in the village and did not contact them after finding a stable life in Jamaica. It was Li Chongxin’s brother, identified as Tom, who had sent money back to support his own family until his death at age 99. One of Li Chongxin’s grandsons, Li Guanqiu, is still alive. Upon meeting Suzanne and Anderson, Li Guanqiu began crying. He said that his father received a bank draft worth 3 to 5 sterling pounds (US$3.93 to 6.54) every month from Tom. After Tom passed way, the Lis never received any information about the two brothers. Later in an interview with local media, Anderson said he felt extremely excited and happy that his mother had finally found her Chinese family after so much time and effort. He added that he would definitely try to learn Chinese and would come back to visit the village again.